Effective Microorganisms allow particularly sensitive people to breathe - used as a room spray they not only neutralise unpleasant odours, they also permanently create an environment where mites and other allergenic agents cannot survive. 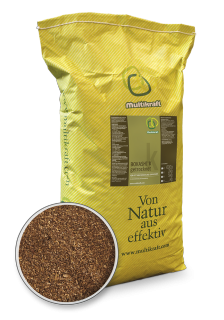 Mix EM Clear into the water and spray the basket, cat litter tray or enclosure with EM Clear solution according to the odour level. 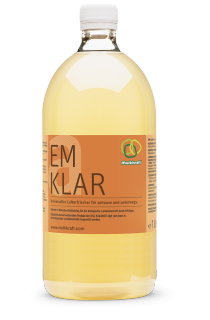 EM Clear active is also available as a ready-to-use EM Clear spray solution. Mix EM Clear active with water. Spray bedding regularly with EM Clear active solution and add a handful (approx. 10 %) of dried Bokashi K.
Mix EM Clear Active with water and spray a few puffs into the room once or several times a day as required. 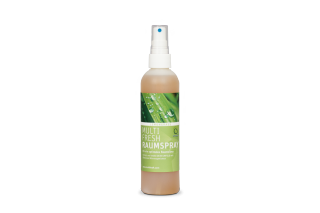 Alternatively, ready-to-use Multi Fresh Romm spray EM Clear can also be used.